The global solid state lighting market is anticipated to grow moderately in coming years. Even though the market is in its initial development stage, it is garnering the focus of regional as well as international players. The level of competition has intensified in the past decade, with firms working on developing new strategies for collaborations in order to come up with economical and effective products that would boost sales. Koninklijke Philips N.V., Panasonic Corporation, Samsung Electronics Co. Ltd., OSRAM Licht Group, General Electric, Eaton Corporation, NICHIA Corporation, and Mitsubishi Electric Corporation are some of the leading companies operating in the global solid state lighting market. According to Transparency Market Research, the global solid state lighting market is anticipated to grow with a strong CAGR of 8.7% within the forecast period from 2017 to 2025. In 2016, the market was evaluated to be worth US$14.48 bn, and it is expected to reach to US$30.38 bn by the end of 2025. Geographically, Asia Pacific region is currently the leading region vis-à-vis growth and revenue generation. The regional market will from the steady economic growth in countries, namely Indonesia, India, and China in the past few years. 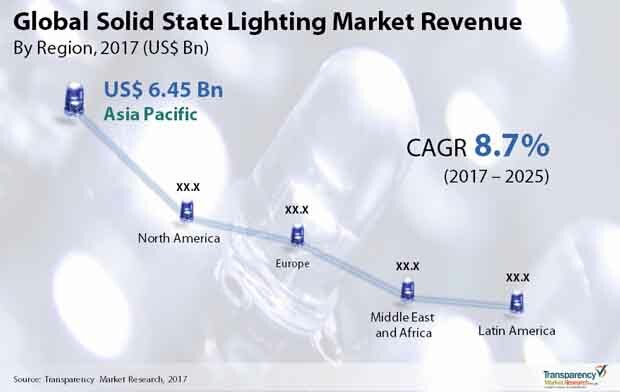 The global solid state lighting market is divided into commercial, residential, outdoor, and industrial lighting based on sector. The commercial segment held the most dominant position with major amount of share in 2016 and is also anticipated to stay at the leading position over the report’s forecast period. There are several factors that are contributing to the advancement of the global solid state lighting market, such as the enormous rise in popularity for energy-efficient lighting in the past couple of years. With a high energy-efficiency, optimum durability, and enhanced profitability, solid state lightings are seeing soaring demand. Being comparatively environment-friendly compared to other famous lighting advances, it is creating monstrous demand in developing and developed economies with progressively stringent environment saving standards in nations, for example, India, China, and Indonesia. The quick rate of urbanization and industrialization in these nations is adding to the growing demand for solid state lighting. In addition, the market for solid state lighting is developing due to the immense progression in technological innovations and lessened expenses in Asia Pacific region. Besides, the expanded adoption of Internet of Things innovation and their combination with solid state lighting are likewise anticipated to affect the general improvement of the global solid state lighting market soon. However, on the other side, there are a few factors that could challenge the general development of the global solid state lighting market. One of the major factor anticipated to affect the market is the moderately higher cost of establishment of these lighting frameworks when contrasted with ordinary incandescent and fluorescent lighting systems. By and by, the growth in investments towards the improvement of smart cities could stir demand for solid state lighting in various regional markets. The comparatively more environment-friendly technology, contrasted with other famous lighting technologies, is creating monstrous demand for solid state lightening in developing and developed economies. The market for solid state lighting is developing due to the immense progression in technological innovations and lessened expenses in Asia Pacific region.